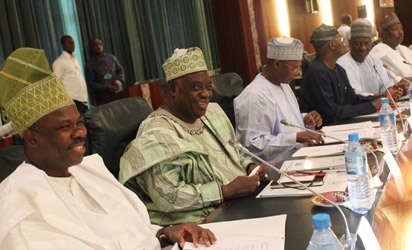 The Nigeria Governors Forum (NGF) met at the Aso Rock Presidential Villa in Abuja on Wednesday night in a closed-door meeting. Although key issues discussed are not yet known, the meeting was quickly arranged ahead of Thursday’s meeting of the National Economic Council (NEC) meeting to be presided over by Vice President Yemi Osinbajo. The governors in attendance were those of Ekiti, Osun, Oyo, Kwara, Kogi, Borno, Kaduna and Katsina. Others are from Jigawa, Imo, Akwa Ibom, Benue, Ondo, Bauchi, Sokoto, Plateau, Niger, Edo and Kebbi.